The Wonderful World of Louis Armstrong: Eleven Year Anniversary! "Hello! My name is Ricky Riccardi and you can learn more about me in the (you guessed it) "About Me" section of this blog. I just wanted to take a second and discuss what this blog is all about. There are tons of Armstrong videos on YouTube and in my Itunes, I have 2,408 Armstrong songs arranged in chronological order. I plan on hitting "shuffle" on my Itunes and whatever Armstrong track comes up first, I will discuss it. I'll provide the musicians, the writers, the soloists, I'll give some analysis of the recording and I'll even tell you where you can buy it or listen to it. On some days, I'll post a YouTube video and do the same. You're more than welcome to comment and offer your own opinions or disagreements to whatever I write. There's really no order to anything, just a (hopefully) daily celebration of Armstrong's music! Enjoy!" Aw, it's almost cute. "Daily" postings? That didn't last long. Still, I'm very proud of the 600+ I did manage to squeeze out in the last 11 years. Let's face it: this blog made me who I am today and starting it ended up being one of the most important decisions of my life. I was painting houses that first day and I'd continue doing it for almost two more full years. But in that time, I made contact with people who would be very important to me in the coming years--the late Gosta Hagglof, the late Jos Willems, Terry Teachout, Michael Steinman, Hakan Forsberg, Dave Whitney, Phil Person and too many more to name; I got invited to Satchmo Summerfest in New Orleans for the first time; I rewrote my book proposal and secured a deal with Pantheon to publish What a Wonderful World: The Magic of Louis Armstrong's Later Years; and finally, in October 2009, I started my dream job as Archivist for the Louis Armstrong House Museum. As they say, the rest is history. All because a Louis Armstrong-loving house painter started a blog. Of course, today, the blog is nearly dormant. People still read it, as I can tell by the stats, and are still discovering entries I wrote on Armstrong tunes years ago. I do miss regularly updating it but don't know if it'll be possible to ever do it again quite like I used to, though I still get requests to cover certain songs from the Armstrong oeuvre from time to time. But even if I'm not contributing regular blog entries, it's safe to say I'm doing more related to Louis than ever before, though now it has transitioned over to social media. I have my own personal Facebook page and I even created an all-Armstrong version for those who don't want to wade through posts about family, baseball and politics. I run all the social media for the Louis Armstrong House Museum so when you see something on their Facebook or Twitter or Instagram, those almost always coming from me. Thus, in some crazy way, the blog never became the "daily" experience I predicted, but thanks to social media and the five pages I run, I'm now posting about Pops every day, sometimes multiple times. One thing I never could have predicted is my moonlighting career as a CD producer. Universal has made me their main Louis guy and the two most recent sets I co-produced with Harry Weinger, Ella Fitzgerald and Louis Armstrong Cheek to Cheek: The Complete Duets and Pops is Tops: The Verve Studio Albums were both featured on NPR's Fresh Air and both ended up hitting the Billboard Jazz charts, which was quite exciting. 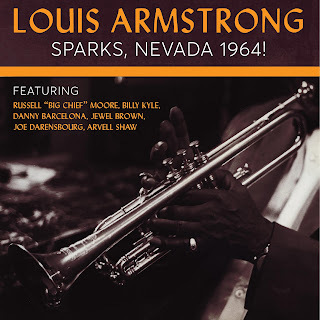 A few years ago, this blog turned into the behind-the-scenes making of a 9-CD Mosaic Records box set of Louis's live Columbia and RCA Victor records of the 1940s and 1950s, co-produced with the great Scott Wenzel. I'm happy to report that Scott and I are cooking up another exciting set, one which will make Armstrong fans truly rejoice. I cannot say anything more because the set hasn't been officially given a green light but we're planning for that to happen soon and we'll be together at Satchmo Summerfest in New Orleans this August to talk about and preview a bit of what we're working on. I could keep going--there'll be exciting news coming from the Armstrong House soon regarding digitization, plus I'll be back at Satchmo Summerfest next month for my tenth-anniversary, and if you don't follow me on Facebook, you might have missed the announcement last November that thanks to speech therapy, I was able to discover and utilize my new/actual voice, which you can hear in this YouTube video of me telling the story of how I discovered Armstrong and made him my lifelong passion. So thanks to all who have supported this blog and all my Armstrong-related endeavors over the past 11 years. Much more to come--POPS IS TOPS!